Art shaped curved trunk with tireed branching. Stiff dark green, short needles (3" - 5" long)occur in Paris. Large grayish white terminal buds help distinguish it from other pines. Fissured bark on trunk and branches which appears on older specimens. Much sought after in Bonsai and takes many years to achieve the look of a superior specimen Bonsai. Circumference of the trunk measures 7.0". Diameter of the trunk measures 2.5". Mikawa is most commonly used variety for Bonsai. Likes Sun. Hardy, keep Outdoors. 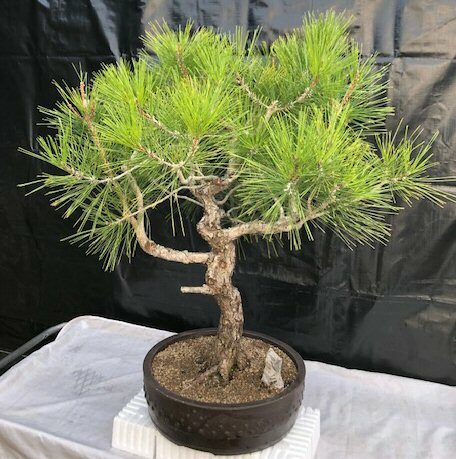 55 years old, 28" x 33" x 34"
Outdoor Evergreen Bonsai, grown and trained by Bonsai Boy. Potted in a 15" brown unglazed hexagon ceramic container. Suitable humidity/drip tray is recommended. To purchase add $21.95. Circumference of the trunk measures 7.0". Diameter of the trunk measures 2.5".